Last year, when Denis Villeneuve unveiled his then-latest film Sicario, I declared that it was the film to inspire confidence in the director’s recently-announced hiring for the long-awaited Blade Runner sequel. But now, I must apologise: not for what I said, but because I said it too early. It is in fact Arrival, his follow-up film over one year later, which should convince doubters that he is the right man in charge for next year’s Blade Runner 2049, because it is evident that he handles the sci-fi genre with a sincere and admirable intelligence, while also making it a highly engaging watch for anyone who isn’t quite on the same intellectual wavelength, but never compromising the weight of its complex ideas for wider audiences. Put simply, Villeneuve is on a serious roll at the moment, and Arrival only accelerates it. Based on the short story “Story of Your Life” by Ted Chiang, the story begins when 12 separate alien crafts land at seemingly random places across the world. 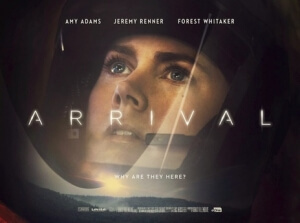 As the world reacts with fear and uncertain hostility, particularly China and Russia which seem determined to destroy their nearby spacecrafts, the US military recruits Dr. Louise Banks (Amy Adams), a linguistics expert, to decipher the aliens’ written language in an attempt to learn their reasons for visiting Earth. Along with mathematician Ian (Jeremy Renner) and army Colonel Weber (Forest Whitaker), she experiences first contact up close with the alien species, dubbed “heptapods” due to their seven tentacles, and attempts to communicate with them before the rest of the world gives in to their hostile fears. Crucially, the film is also peppered with sudden flashbacks to Louise’s time with her daughter, who we see in the opening few minutes succumb to terminal cancer at a young age. How this particular plot thread works its way into the larger narrative should be left a closely-guarded secret by anyone who is lucky enough to see it before everyone else, as it is best experienced with as little fanfare or warning as possible, to ensure maximum mind-bendiness. To say that it is a complex narrative is something of an understatement, despite it seeming very simple just from reading the synopsis, and perhaps a second viewing of the film is required to fully understand its ideas and where the film takes them. Nonetheless, it remains a captivating watch even from just the first initial screening, as Villeneuve once more brings his masterful sense of build-up and slow-burn reveals to the frame to make it an incredibly suspenseful ride. The long – and sometimes literal – leap towards our first contact with the aliens is a stunning extended sequence, shot and framed like a Stanley Kubrick film half the time (the humans’ spacesuits and particularly those giant monolith-like ships certainly have a 2001 ring to them) and slowly but surely making the eventual reveal of the extra-terrestrial visitors worth it. From there, the communication scenes as we see the aliens – cloaked in fog behind a transparent wall – displaying symbols resembling coffee stains as written messages, and the humans’ simple approaches to understanding what they mean, feel positively like some of Spielberg’s earlier work. But Arrival takes a very different direction than Close Encounters of the Third Kind did, offering a more grounded and thoughtful vision of alien interaction that honestly puts films like District 9 and Contact to shame, allowing for a more cerebral approach that treats its audience with respect and refuses to conform to a kind of action-orientated Hollywood climax that these kind of large-scale sci-fi films tend to do. Though there are certainly some elements of tension and even explosive circumstances scattered throughout, the key word is “some” as they are far and few in between, and the main focus is where it needs to be: on the quest to communicate with an alien species and learn their secrets. Villeneuve’s tight direction and Lights Out writer Eric Heisserer’s complex script is expertly sold by its lead actors, particularly Adams who delivers a soft and non-theatrical performance as someone who discovers things that extend even beyond first contact with alien lifeforms. It is also a breath-taking film to look at, and although his regular cinematographer Roger Deakins isn’t around to help this time (don’t worry: the lensing legend will reunite with the director for Blade Runner 2049) Bradford Young takes as much advantage of the environments and moods as he can, to make something that looks grim but also wonderfully surreal, like a healthy mix between Kubrick and Christopher Nolan. Composer Jóhann Jóhannsson (nominated last year for his work on Villeneuve’s Sicario) also continues to be one of the more interesting musicians to work in films these days, here contributing a score that combines vocals and instruments to a haunting and stunning effect. In addition, the visual effects are very simple but are quite astounding for a small-ish budget of $50 million; the designs of the spacecrafts are also pretty cool, as though the 2001 monoliths got a seriously sleek – and less faulty – iOS update. Arrival is an extraordinarily thoughtful and cerebral sci-fi tale of alien communication, one that takes a grounded approach and focuses on the intellectual aspects rather than just pure alien action, adding up to a smartly made and superbly acted human drama that just happens to have aliens in it.